Certain readily available succulents not only get by on rainfall alone, they’ll grow in nutrient-poor soil and can handle searing sun and frost. 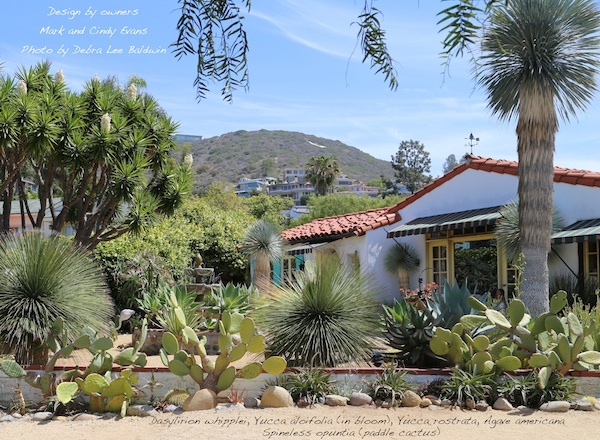 No-water succulents for Southern California gardens that are native to the Southwest and Mexico include dasylirions, agaves, cacti and yuccas. They thrive from south of the border to the Bay Area and in parts of Colorado, Texas and the Carolinas (Zones 7b and higher). Above: Mark and Cindy Evans’ hilltop landscape in Laguna Beach is several miles inland from the coast. 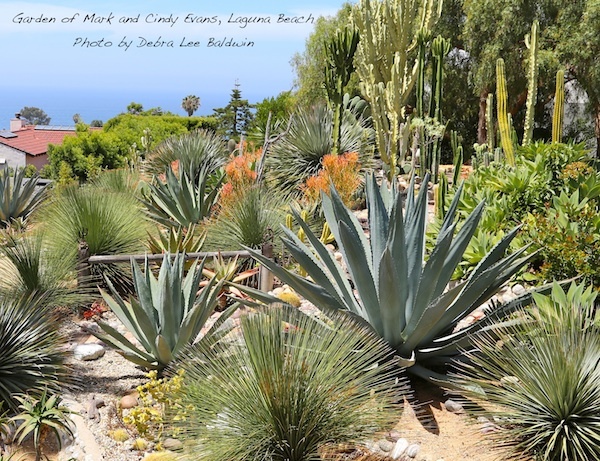 It features these no-water succulents for Southern California gardens: several varieties of dasylirions, agaves, cacti and yuccas. Also in their garden are highly drought-tolerant South African succulents such as euphorbias, crassulas (jades) and aloes. Can you tell which is which? 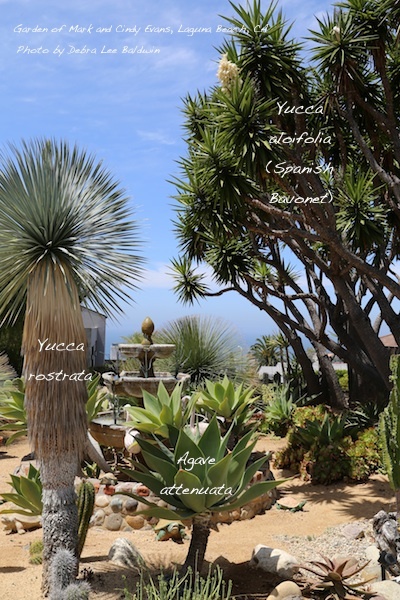 Above: In the Evans’ garden are Yucca rostrata, Agave attenuata and Yucca aloifolia (Spanish bayonet). A topdressing of golden decomposed granite lends a finished look. Above: Two Dasylirion whipplei (which resemble pincushions) are 15 years old. The Yucca aloifolia at left was there when Mark and Cindy bought the house in 1999. “I think it’s pretty old; its base is huge,” Mark says. Four silvery blue Yucca rostrata also are 15 (the much larger one at right gets more sun). Mark planted the spineless paddle cactus along the wall from cuttings six years ago. Behind them, at right, is a 6-year-old blue Agave americana. Growing in the dry fountain are 8-year-old foxtail agaves (Agave attenuata). Obtain my comprehensive guide to succulent landscaping, Designing with Succulents. Copyright © 2018 Debra Lee Baldwin. All rights reserved.